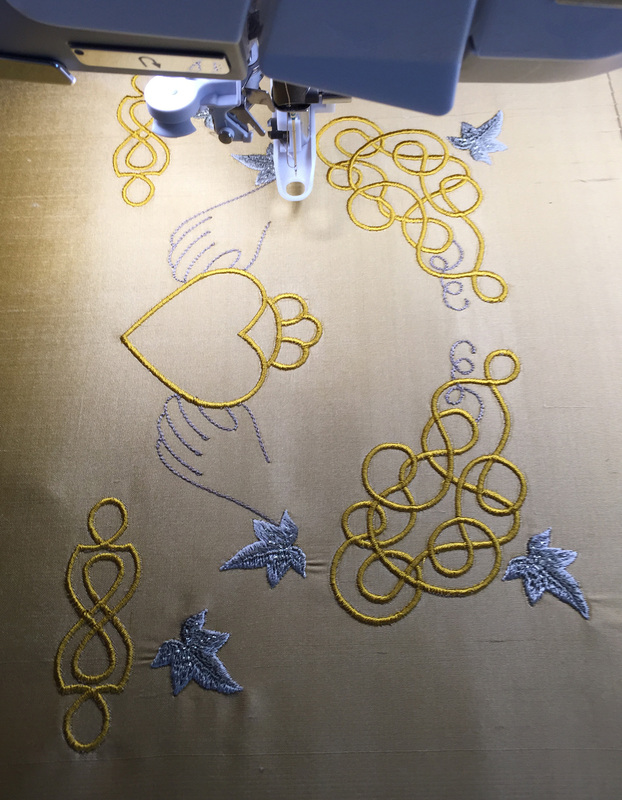 Adding some dimension to embroidery can be a challenge but I have tried to make it as easy as possible with the designs which have this option. 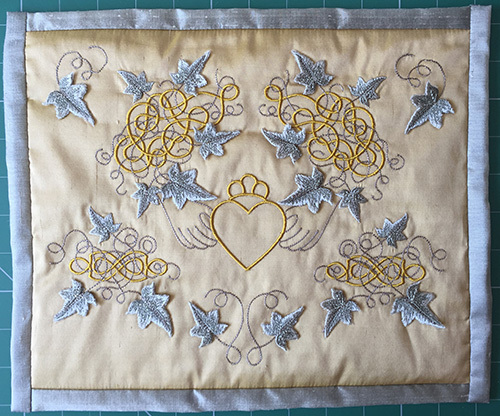 A little practice may be advisable to perfect the technique, but when you master adding pre embroidered appliques to your projects, it opens up lots more choices and you will be so proud of your achievements. Let me show you how I took one of the Celtic Ivy designs and made it into something special and unique! Naturally I used silk dupion for this and found a rich gold silk on which to embroider my designs. 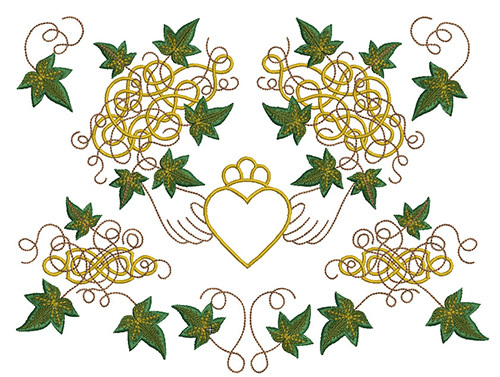 The Celtic Ivy designs are listed as being embroidered in 2 bright greens but I decided to tone them down somewhat. However before beginning the embroidery I decided to combine a few designs together. My main design was GFE-CVY-3-4 which contains a Celtic Claddagh. The Claddagh has hands representing friendship, a heart for love and a crown for loyalty and is popular for Irish and Celtic weddings as I understand it. This design fits a 240 mm by 150 mm hoop but I wanted to use my new 360 mm by 260 mm hoop, so I mirror imaged GFE-1-17 to each top corner, and GFE-1-8 to each bottom corner. That left a gap under the heart which was just big enough for a pair of GFE-1-18 designs. 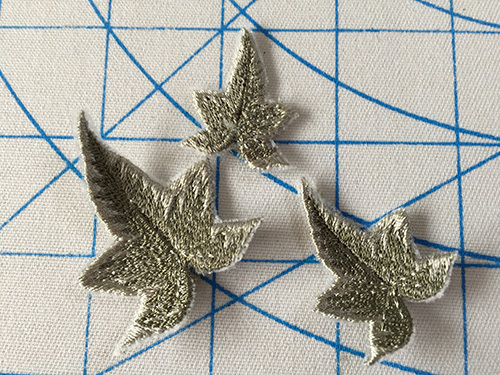 Now when you look at these designs in your software or on your machine you will see that there are several sizes of ivy leaves, and only the larger ones are suitable for applying as appliques. In my designs the designs with this feature as stored in their own folder and are stitched out after the smaller leaves. A line of stitches marks the position of the securing stitching that runs down the middle of the leaf. 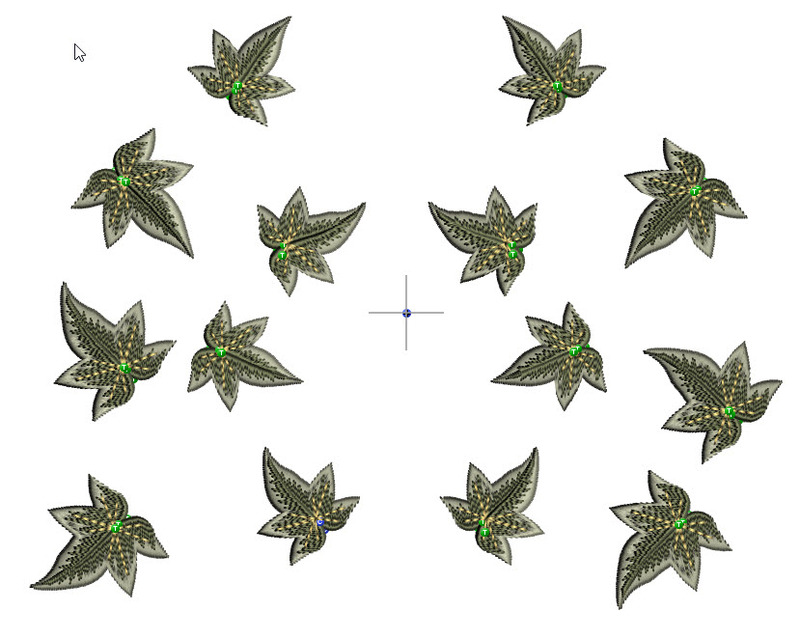 I selected these leaves including their gold detail and pasted them on to a new design file. 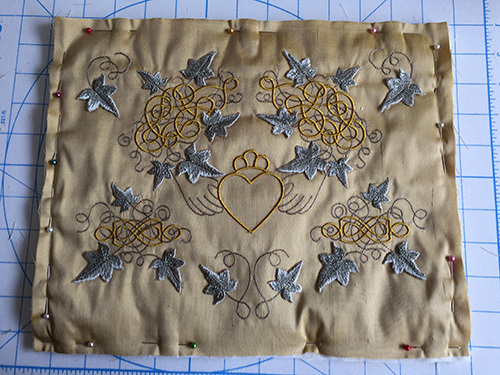 By rotating and moving them around I managed to reduce the size of the design so I could stitch them all out on organza in an 8″ square hoop. I did a little experiment to see if organza was required and trust me it is, as the edges of the ivy leaves fall apart not having enough outer support without it. I used a mesh type stabiliser, Sulky’s Soft ‘n sheer, as this holds the designs and does not show. Obviously there are other options like wash-aways but this worked perfectly. I decided to use Sulky Rayon 40wt 1229 Light putty and 1211 Light Khaki and 1070 Gold. Remember my old trick of using a daylight lamp with a magnifying glass to do the trimming around the leaves. Investing in one of these really makes a difference for close work as you get older. When cutting these leaves I tend to cut into the corners rather than cut one and cut out of the other side. The tips of the leaves need a little cross ways cut too. 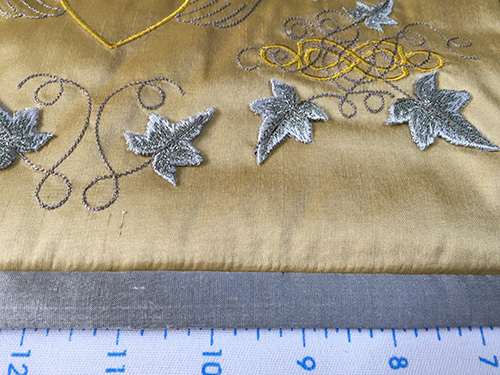 When you have trimmed all your leaves and given them a dab of Fray check where they appear to be snipped or likely to unravel, it is time to start the main embroidery. Prepare your fabric by pressing it. As you can see from this photograph, I have not hooped the fabric, just some stitch and tear, then the silk is laid on top after a spray of temporary adhesive. A box of basting stitches holds the silk in place. 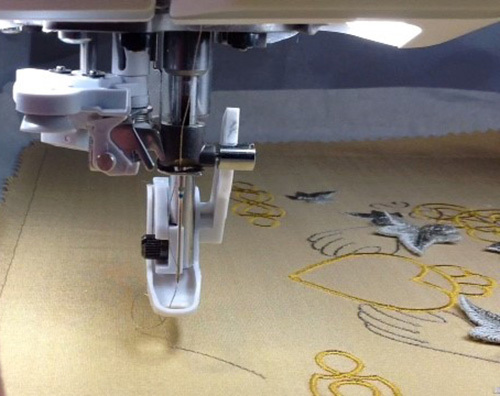 If your machine does not have this feature you may have to hoop the fabric too. 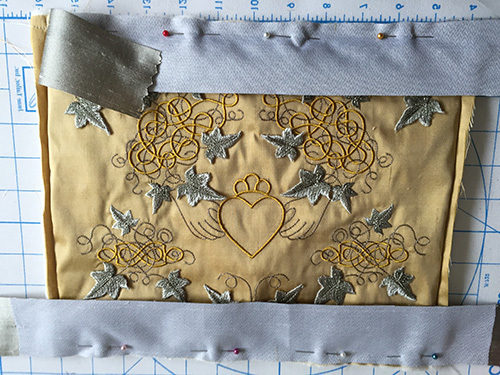 Stitch out the Celtic ribbon work of the design and the smaller leaves. Now before each ivy leaf is added there will be a colour way that is just a line of running stitches. 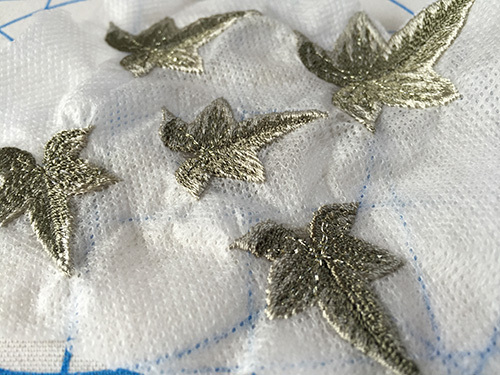 Although this is not repeated in the original designs and the next colour secures the leaf in place and adds the stem, I found it more helpful to step back one colour way and use the guide as the first securing stitches. 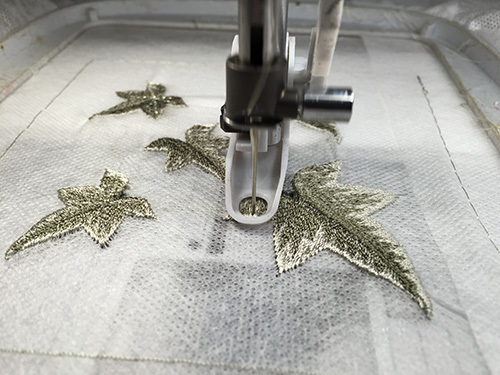 You will have much more control over your embroidery and be able to make slight adjustments to the leaf position, if you use your foot pedal at this point to control the stitches, leaving both hands are free. If you are worried about putting your hands near the needle, use tweezers to hold each leaf. I decided to apply all my ivy leaves and remove the hoop from my machine, then check to see if any needed to be reapplied. It is best to check the alignment from above the design, rather than looking into your machine. If you are unhappy with any of the leaves, carefully slip your seam ripper underneath to cut just the stitches that hold the leaf. 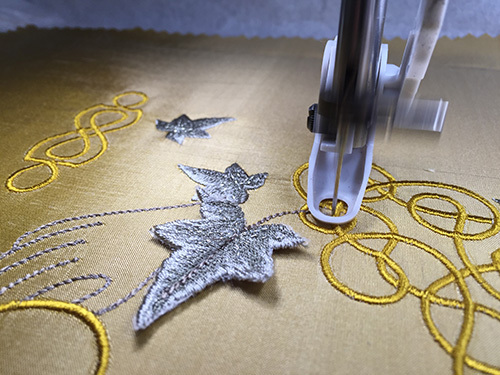 Remove all excess threads from the fabric and from the leaf. Take your machine back to the appropriate place and reapply stopping just as the stitches go beyond the leaf. 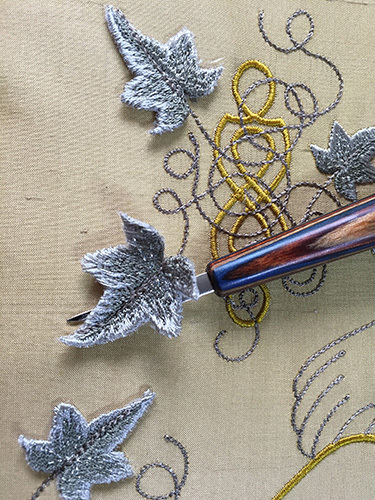 When you are happy with the placement of your leaves, remove the embroidery from the hoop. Tidy up the back, removing as much stabiliser as possible, and trim all jump stitches, especially all the bobbin threads as these can cause puckering. Then lay the embroidery on a terry towel and press from the back. When pressing a large embroidery like this I start at one side, working across the embroidery, pulling the fabric at the same time. If you are pressing silk do not steam as any creases can become permanent. My Celtic claddagh was for a display so I laid a layer of batting underneath and backed it with some cream cotton fabric. Here you see my sandwich pinned together. Before I started to add the bindings I stitch around the sandwich to make sure that it was all laying flat, as it is easier to just unpick just those stitches, rather than remove bindings. I had some wonderful grey/sage silk which had a interfacing already attached, which was perfect for my bindings and matched the green of the leaves. I applied the top and bottom bindings first, folding them over and hand stitching in place before attaching the sides. Then pin, sew and hand sew the other bindings. Be careful to press the bindings and the back of the finished projects. I hope showing you how I created my project will inspire you. 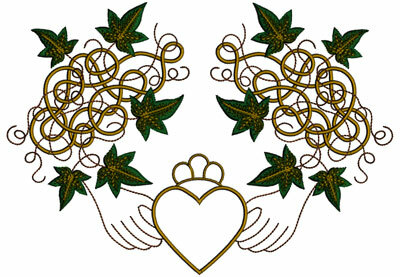 If you create something with the Celtic Ivy designs do send me your photos. These designs and most of my designs are part of my Birthday sale at present, which runs until Monday 19th September, 2016. Using the coupon code silk will get you 75% off. 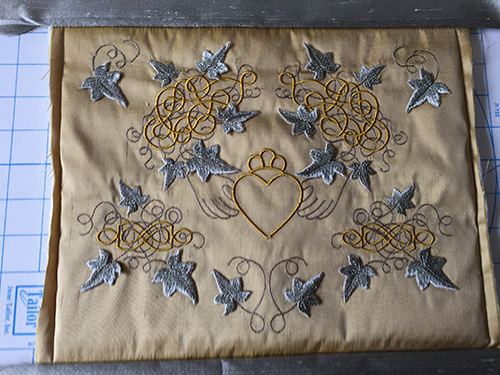 This entry was posted in Discussing machine embroidery and tagged 3 Dimensional embroidery, Celtic Designs, combining embroidery designs, embroidery on silk, Hooping only stabiliser, machine embroidery. Bookmark the permalink. WOW! I think the leaves may be a variant of the free standing lace technique. The design is incredibly beautiful, and the helpful tutorial is appreciated. Thank you Hazel, this will be extremely helpful.